This guide has been updated for netplan, introduced in 17.10. Please test the configuration and let me know if you have any issues with it (easiest via tweet, @jasonbayton). LXD works perfectly fine with a directory-based storage backend, but both speed and reliability are greatly improved when ZFS is used instead. 16.04 LTS saw the first officially supported release of ZFS for Ubuntu and having just set up a fresh LXD host on Elastichosts utilising both ZFS and bridged networking, I figured it’d be a good time to document it. In this article I’ll walk through the installation of LXD, ZFS and Bridge-Utils on Ubuntu 16.04 and configure LXD to use either a physical ZFS partition or loopback device combined with a bridged networking setup allowing for containers to pick up IP addresses via DHCP on the (v)LAN rather than a private subnet. This walkthrough assumes you already have a Ubuntu 16.04 server host set up and ready to work with. If you do not, please download and install it now. You’ll also need a spare disk, partition or adequate space on-disk to support a loopback file for your ZFS filesystem. Finally this guide is reliant on the command line and some familiarity with the CLI would be advantageous, though the objective is to make this a copy & paste article as much as possible. lxd is already the newest version (2.0.0-0ubuntu4). 0 upgraded, 7 newly installed, 0 to remove and 16 not upgraded. Need to get 884 kB of archives. zed.service is a disabled or a static unit, not starting it. Need to get 28.6 kB of archives. You’ll notice I’ve installed LXD, ZFS and bridge utils. LXD should be installed by default on any 16.04 host as is shown by the output above, however should there be any updates this will bring them down before we begin. ZFS and bridge utils are not installed by default; ZFS needs to be installed to run our storage backend and bridge utils is required in order for our bridged interface to work. With the relevant packages installed, we can now move on to configuration. We’ll start by configuring the bridge as before this is complete we won’t be able to obtain DHCP addresses for containers within LXD. This will set the eth0 interface to manual and create a new bridge that piggybacks directly off it. Following any edits, it’s a good idea to restart the interfaces to force the changes to take place. Obviously if you’re connected via SSH this will disconnect your session. You’ll need to have physical access to the machine/VM. 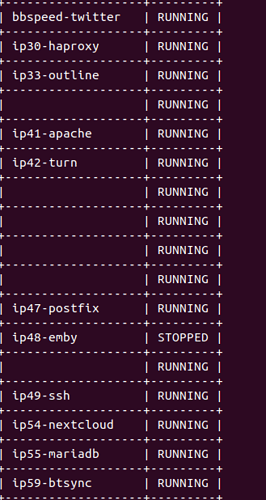 With the bridge up and running we can now begin to configure LXD. Before we start setting up containers, LXD requests we run sudo lxd init to configure the package. As part of this, we’ll be selecting our newly created bridge for network connectivity and configuring ZFS as LXD will take care of both during setup. For this guide I’ll be using a dedicated hard drive for the ZFS storage backend, though the same procedure can be used for a dedicated partition if you don’t have a spare drive handy. For those wishing to use a loopback file for testing, the procedure is slightly different and will be addressed below. If your disk/partition is currently formatted and mounted on the system, it will need to be unmounted with sudo umount /path/to/mountpoint before continuing, or LXD will error during configuration. Additionally if there’s an fstab entry this will need to be removed before continuing, otherwise you’ll see mount errors when you next reboot. As of LXD 2.5 there have been a few changes. If installing a version of LXD under 2.5 please continue below, however for 2.5 and above in order to use the pre-configured bridge select No for Do you want to configure the LXD bridge (yes/no)? 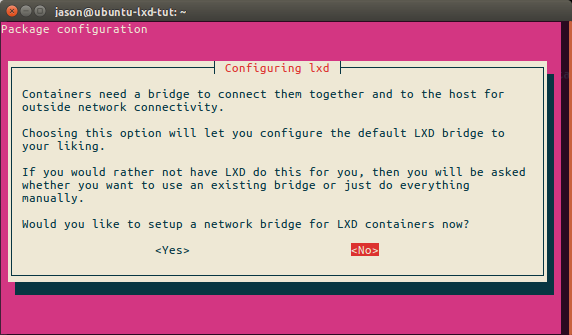 then see Configure LXD bridge (2.5+) below for details of adding the bridge manually after this. Check the version of LXD by running sudo lxc info. Here we’re defining ZFS as our storage backend of choice. The other option, DIR, is a flat-file storage option that places all containers on the host filesystem under /var/lib/lxd/containers/ (though the ZFS partition is transparently mounted under the same path and so accessed equally as easily). It doesn’t benefit from features such as compression and copy-on-write however, so the performance of the containers using the DIR backend simply won’t be as good. Here we’re creating a brand new ZFS pool for LXD and giving it the name of “lxd”. We could also choose to use an existing pool if one were to exist, though as we left ZFS unconfigured it does not apply here. Here we’re opting to use a physical partition rather than a loopback device, then providing the physical location of said partition. It’s possible to connect to LXD from other LXD servers or via the API from a browser (see https://linuxcontainers.org/lxd/try-it/ for an example of this). 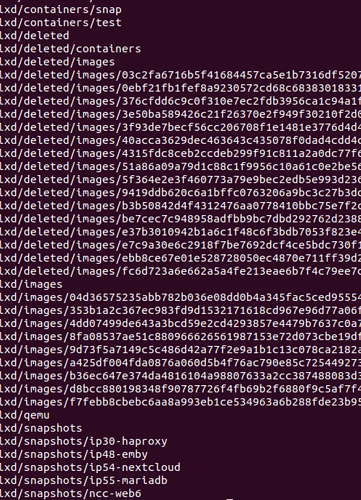 Where some-secret-string is a secure password that’ll be required by other LXD servers wishing to connect in order to admin the LXD host or retried non-public published images. We don’t want LXD to create a new bridge for us, so we’ll select no here. 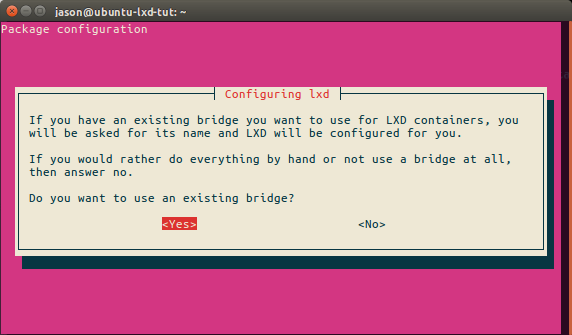 LXD now knows we may have our own bridge already set up, so we’ll select yes in order to declare it. Finally we’ll input the bridge name and select OK. LXD will now use this bridge. And with that, LXD will finish configuration and ready itself for use. In version 2.5, the above purple bridge workflow has been retired in favour of the new lxc network command. It’ll be obvious if this needs to be done as running lxc network attach-profile br0 default eth0 will result in the error error: device already exists. With that complete, LXD will now successfully use the pre-configured bridge. Run sudo lxd init as above, but use the following options instead. The size in GB of the ZFS partition is important, we don’t want to run out of space any time soon. Although ZFS partitions may be resized, it’s better to be a little generous now and not have to worry about reconfiguring it later. Since it’s entirely possible we may in the future wish to run multiple LXD containers, it’s a good idea to already increase the number of open files and inode limits, this will prevent the dreaded “too many open files” errors which commonly occur with container solutions. After saving the file we’ll need to reboot, but not yet as we’ll also configure the open file limits. Once the server is rebooted (this is important!) the new limits will apply and we’ll have future-proofed the server for now. Success! The only thing left to do now is launch a container. We can see the xen1 container has picked up an IP from our DHCP server on the LAN, which is exactly what we want. While a little long-winded, setting up LXD with a ZFS storage backend and utilising a bridged interface for connecting containers directly to the LAN isn’t overly difficult, and it’s only gotten easier as LXD has matured to version 2.0. Are you brand new to LXD? I thoroughly recommend you take a look at LXD developer Stéphane Graber’s incredible LXD blog series to get up to speed. Thank you for the amazing article! I’m considering migrating my existing server using this guide. I’m currently running ESXi with my 6-disk RAID-Z2 passed through to a FreeNAS VM as described in the guide here but on ESXi 6.5 and FreeNAS 11.x. My goal is to install Ubuntu 16.04 to a 120 GB SSD and create a partition on the SSD that will be dedicated to ZFS. My containers will live there. I need to figure out how to import my existing RAID-Z2 zpool, as that’s where my media lives. The LXD zpool will host a Plex container, and that Plex container will mount its media folders from the existing 6-disk zpool. Whether LXD is even the right application for my Plex container or if Docker is better suited. How I’m going to mount the media folders in the Plex container. Currently, I have Plex installed on an Ubuntu VM in ESXi that uses nfs mounts in fstab to mount the FreeNAS shares. Once I migrate using your tutorial, I shouldn’t need NFS mounts since they would be “local” storage if I’m understanding things correctly. This will be nice, as I can get away from having an internal “storage-only” network with 10Gbe VMXNET3 adapters and jumbo frames in addition to the standard, internet-routable virtual NICs at MTU 1500. Looking forward to putting your post into action! ZFS is pretty good with exports/imports and send/receive as long as the remote system can accept a pool of the size you’re trying to push Check out an example here. Not dramatically dissimilar from my setup! I need to add in a 2nd SSD at some point for LXD container redundancy. If that SSD dies I’ll need to do a lot of restoring. Docker is more than adequate if that’s what you’re happier with though… and requires no update maintenance. For 2, I use LXD devices to push folders into containers… though you could well instead utilise a FUSE filesystem like SSFS to mount directly within the containers. If pushing the folders, you’ll need to ensure the UID/GID mapping is correct, else the container won’t be able to write to them. See this. Thanks for the tips! Considering you’re using a dedicated SSD for LXD while I’m using a partition on my Ubuntu SSD for LXD, should I just go ahead and make the entire SSD use ZFS? Is that possible? I haven’t even begun this project, so there’s still so much to plan. At the very least, I’d like to explore the option of setting up my home partition in ZFS (or moving it to ZFS post-install if I can’t do it while installing Ubuntu). My goal in all of this is to have an environment can be re-created very easily if my single point of failure (the SSD) were to fail. Ideally, I’d like to be in a position where all of the LXC containers in my Ubuntu SSD’s LXD zpool are backed up to my media’s zpool (6x3TB RAID-Z2). Then if my SSD were to fail, I could simply get a replacement SSD, Install Ubuntu, install LXD, and run a few commands to import my media’s zpool, which then would allow me to import a backup of my LXD zpool onto the new SSD’s LXD partition. If I understand this concept correctly, I’d be back in business in under an hour. Can you expand upon this? Would I not use an identical (similar?) system for mounting media folders into the Plex container? Or do you have some kind of LXC container that mounts /tank/media directories into your Plex container so the Plex container is actually mount-agnostic? should I just go ahead and make the entire SSD use ZFS? Is that possible? I haven’t even begun this project, so there’s still so much to plan. At the very least, I’d like to explore the option of setting up my home partition in ZFS (or moving it to ZFS post-install if I can’t do it while installing Ubuntu). Ideally, I’d like to be in a position where all of the LXC containers in my Ubuntu SSD’s LXD zpool are backed up to my media’s zpool (6x3TB RAID-Z2). 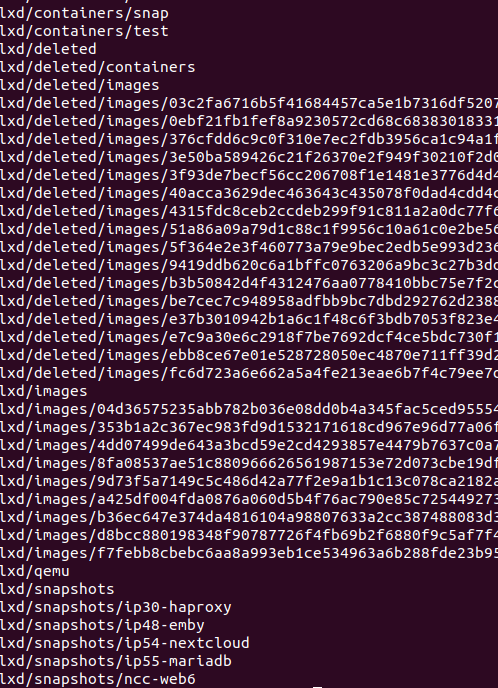 What I tend to do is lxc copy my snapshots to a 2nd host as a container, like lxc copy container1/snap2 remote:containerbackup2 which likely isn’t a very efficient way to do it either, but I have the machines running to accommodate it. Restoring LXD isn’t super easy either, it’s not just a case of reimporting the LXD pool as you’ve got configuration files and databases to consider too. You inspired me. I made a tutorial that is part your guide and part the rest of the internet. See post here: Ubuntu 18.04 LXD/LXC, ZFS, Docker, and Advanced Networking. Thanks for this post. I’ve been setting up test containers for the last couple of years but it’s always nice to see a concise howto to confirm what I know and pick up little hints. I had been missing the “lxc network attach-profile br0 default” step. Thanks for the post. I have used it to setup my lxd host. If i could ask a question: I have /etc/defaults/lxd-bridge configured for my ipv4 network. I have added a lxd-dnsmasq.conf file to assign a static IP to container. But when I start the container I lose connectivity to the host (ping/ssh) over the network. If I shut down the container, restart networking it comes back online. What could I look at to see what is causing this? Start with your logs – syslog, dmesg, etc to see if anything interesting is being stated there. For some reason it makes me think there might be an issue with the bridge, but honestly too little info to start guessing. Out of topic.,, I’m new to ZFS, and was reading some information regarding GlusterFS on ZFS. Is there any documentation or howto somewhere to create a distributed filesystem where I can have the LXD containers in a shared storage and run them in different nodes? Basically I want VM’s (now containers) so that they be moved easily from one host to another. I read about zfs send/receive but that will move the container and this is what I don’t want, maybe live migration, or in the worse case, stop and start in another host? That’s an interesting usecase that honestly I’ve not considered at all up to this point. I’d be wary about such an implementation as that’s not how LXD is designed to run, adding a container to storage won’t render it usable via lxc commands without first importing it and I’m not sure how things like snapshots would be handled (again maybe synced but not available outside the origin server to be interacted with. I’ll try the send/receive meanwhile. But I ran into another issue. I created the pool/bridge/etc// and I was using the bool for some other things.. I put backup files, home folders.. etc.. 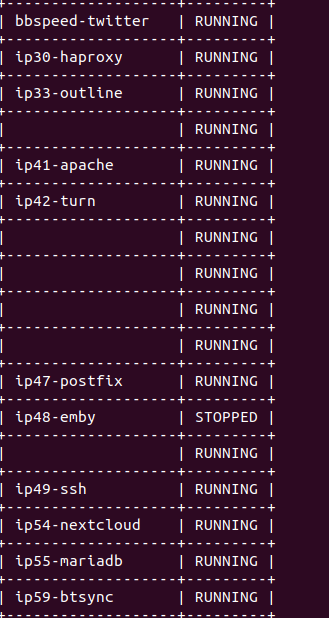 I reinstalled the host, resintalled lxd and surprise. lxd init I can’t use an existing pool, I have to create a new one. error: Setting the key “storage.zfs_pool_name” is deprecated in favor of storage pool configuration. Does this mean I can’t reuse a previously created pool? LXD init expects to setup a new environment, so it errors like that on purpose. If you can, mount the volumes, backup the containers and init LXD with a new ZFS pool or clear down the existing, then import the containers again. There’s a doc somewhere I recall that outlined the process but I can’t find it at the moment. If all else fails, the Devs hang out on freenode under #lxcontainers. They’ve guided me through a similar issue when an update broke everything. Anyway.. I’m loving these containers. Storage management is official as per a recent release (if you’re on their stable PPA) – I haven’t made use of it on my existing systems but will do when I next rebuild. Thank you, very nice post! I’m working with LXD version 2.0.9 i have an static IP at my br0 interface but my eth0 did not get an ipv4 (online ipv6) but as i see in your post this is normal… i did setup an new Ubuntu 16.04 server exactly as shown in this Post, two times, and both have the same Problem. I can’t really tell from here I’m afraid. Can you output your br0 configuration? Can you confirm bridge-utils is installed correctly? I had the same issue running via VirtualBox configured with a bridge network interface. Enable Promiscuous mode on the VirtualBox network bridge interface from the virtualbox settings and power-cycle the VM. I ran a TCP dump in the VM and on the host box and found that the DHCP requests are being sent all the way out to my my firewall which is receiving the DHCPDISCOVER requests, and even responding with a valid DHCPOFFER. While the reply packet gets to the VirtualBox host, the guest never receives the DHCPOFFER packet since VirtualBox was not allowing promiscuous mode listening for the interface. I’m trying to set up lxd on an existing server that already has an existing zfs pool. The problem I have is that lxd init is not even offering me the option to use zfs as a storage backend and no amount of googling seems to get the right search results. You’re not seeing “Name of the storage backend to use (dir or zfs): “? Indeed there’s another command to reconfigure the network once set so you’re safe on that front. Just an FYI if you try this static IP configuration on the next Ubuntu LTS release (Bionic Beaver 18.04) you’ll likely run into a networking nightmare. The way networks are configured has completely changed in 18.04, see man netplan. Thanks for the heads-up. The guide is due an update with new LXD features, so I’ll sort out the networking at the same time (or, depending on the changes required, document and link to it separately). Ok, this is all cool, but why I can’t find any info on how to make it work together with Netplan, which is a new standard for network configuration? Because I haven’t written it in yet.